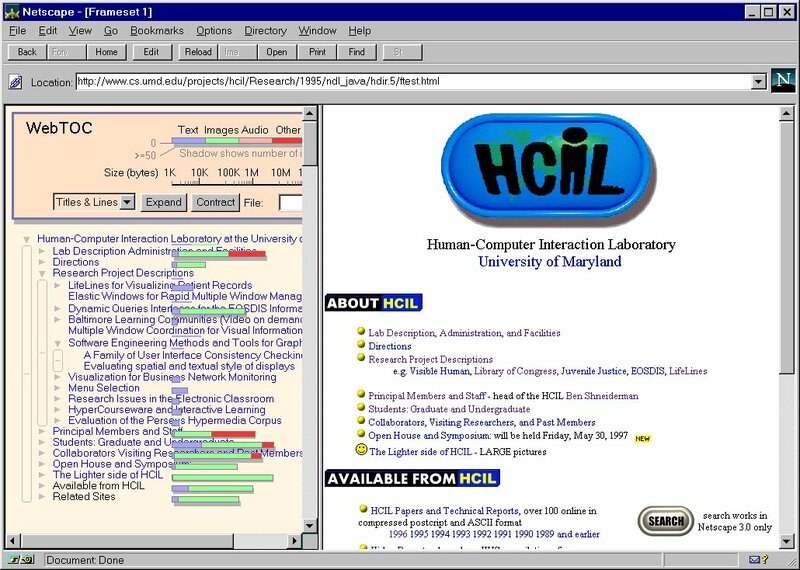 WebTOC is a new tool developed at the University of Maryland Human-Computer Interaction Laboratory (HCIL) that gives a visualization of the contents of a Web site. It consists of two parts: the WebTOC Parser and the WebTOC Viewer. The Parser starts with a Web page and follows all the local links, generating a hierarchical representation of the documents local to the site. The Viewer displays this information as a Table of Contents (WebTOC) for the site using a standard Web browser. The lines of text in the WebTOC each represent a link to a document which may be another Web page or a multimedia file such as an image or audio file. A user can display a document referenced by a link by clicking on it as she would a normal Hypertext link. In addition to the lines of text, each local document is represented by a colored line with a length corresponding to the size of the file. The color of the line represents the type of file (e.g. text, image, audio). When a document contains links to other documents, the lines representing the documents it includes can be collapsed into a thicker "size bar" that shows the total size of the documents it references. Each size bar has a shadow under it. The size of the shadow indicates the number of items subordinate to the document it represents. This gives a visual cue to let the user distinguish quickly between items with a few subordinate links or many links. As an alternative, a bar representing the number of items can be shown. The user has the option of viewing just the colored lines without the text descriptions of the Table of Contents to get a compact visual representation that gives an overall view and makes size comparisons easier. The WebTOC Viewer is implemented as a java applet so that it can be used without change on multiple types of computer systems and with any Web browser that supports java. The Parser is currently a java program but it can also be implemented as an applet. Due to memory limitations and time required to load the WebTOC file the total number of links that can be practically represented is about 10,000. A paper on WebTOC ( UMD technical report) was presented at the 3rd Conference on Human Factors and the Web and is available online. 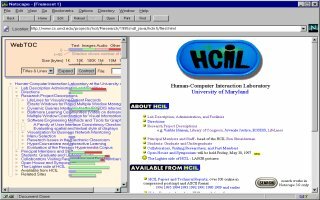 The WebTOC software and documentation are available from the HCIL FTP site (ftp://ftp.cs.umd.edu/pub/hcil/Demos/WebTOC/index.html). For further information or questions concerning the software contact David Nation.